In the first pan I put some baby bok choy, to which I added maybe a quarter cup of water, a generous pinch of salt and covered with a lid. The second pan I put in shisito peppers, a third of a cup of water, some soy and fish sauce and covered that with a lid too. By the time I changed into my pj’s, both pans were boiling and pretty much finished. 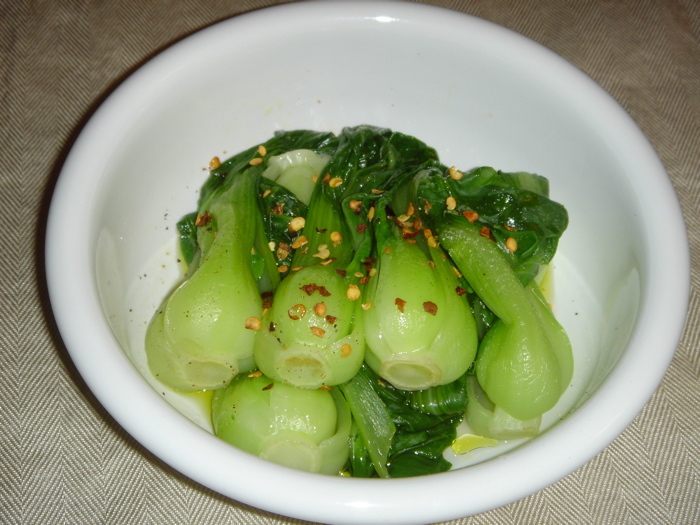 I plated the bok choy, cracked some black pepper over it, added chili flakes and drizzled with extra virgin olive oil. The other pan seemed to have less liquid in it, so I added a little more water, then added a packet of bonito flakes as soon as it came back to a simmer I served it up. Now normally, I’m a total steak and potatoes kind of guy, but damn, I have to say these two veggie dishes hit the spot tonight. If you’ve never had shisito peppers, they are usually completely mild and heat-free, but I’d say about one in every twenty of them will be mind-blowingly hot. The Japanese say you’re lucky if you get one of the hot ones. Tonight I was very “lucky” and got two of the hotties. Fortunately the heat of a shisito is different than other peppers in that they seem to only burn your tongue for about a minute or so and then the heat is gone. Other chilis can linger and numb your mouth for the duration of the meal, but shisitos do their business and disappear just as quickly. That heat from the shisitos and the subtle heat of the chili flakes on the bok choy were just what I was craving after a night of drinking, and I’ll be damned if this wasn’t one of the most satisfying veggie meals I’ve ever had. Nice simple flavors and a great change of pace for me. Yum. The fact that you had the presence of mind to take these photographs, indicates that you clearly did not drink enough. 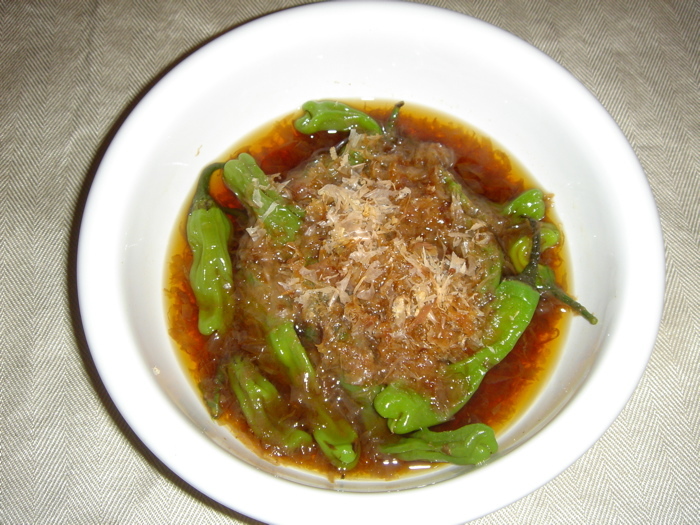 in spain- there is this popular tapas dish- pimentos del padron- deep fried shishito peppers with salt….sooo yummy- i can eat that ALL day.